It was Halloween night, and the Tipton Cardinals needed a tackle. With the team trailing Sacred Heart 27-18 in the opening round of the Missouri high school playoffs, a stop here–on first down and 10 with less than seven minutes to play–would help keep its fading season alive. Chad’s father Ken raced out of the stands and motioned for Amy to follow. As she darted onto the field, a referee warned her to slow down on the slick and muddy turf. “I can’t! I have to get there!” Amy replied. Football’s grip on the time, passions and wallets of the American public has never been stronger. But as another season gets under way, the game is under a shadow. One of the worst weeks in professional football’s half-century march to cultural dominance began on Sept. 8, when grainy surveillance video posted on TMZ.com showed Baltimore Ravens star Ray Rice knocking his fiancée unconscious inside a casino elevator. The appalling footage forced the National Football League to punish Rice with something more than a wrist slap, which in turn cast a harsh glare on the NFL’s lax handling of other players who had recently been arrested–and in one case convicted–for domestic violence. The next shoe dropped four days later, when Adrian Peterson, another star running back, was indicted on charges of abusing his 4-year-old son. These stories seized the headlines and all but eclipsed a disturbing indictment of the game itself. In a court filing made public on Sept. 12, the day Peterson was charged, the NFL estimated that nearly one-third of former players will develop dementia, Alzheimer’s disease or other debilitating neurological disorders like Parkinson’s and ALS. For years, the NFL had denied a link between blows to a player’s head on the field and subsequent brain damage. This admission–based on data crunched by actuaries as part of a settlement between the NFL and some 5,000 former players who sued the league for allegedly covering up the risks of concussions–is a blunt confirmation that pro football players are far more likely than the general population to become severely brain damaged. Nowhere is this discussion more urgently needed than in the cherished culture of high school football. In a study on concussion rates in high school sports published on Sept. 17, researchers at the Colorado School of Public Health found that football had the highest incidence of the brain-rattling impacts–nearly 45% more than the runner-up, girls’ soccer. That rate, which accounts for games and practices, more than doubled for high school football players from 2005 through the 2013–14 school year. This steep increase reflects greater awareness of concussion risks: kids, coaches and parents are more likely to report head injuries. It also raises questions about the nature of the game. What’s more, it doesn’t take a concussive hit to cause lasting damage. A recent study of 25 college football players with no formal concussion history, published in the Journal of the American Medical Association, found that the players had significantly less than normal volume in the hippocampus, the region of the brain that controls memory. In April, researchers from the University of Rochester published a study showing that the brains of another group of college players with similarly concussion-free records had significant changes in their white matter, which is crucial for basic cognitive functions. Even football’s youngest, smallest players are susceptible to brain injuries. Virginia Tech’s biomedical-engineering department tracked 19 boys ages 7 and 8 during the 2011 and 2012 seasons. The researchers counted 3,061 blows to the heads of the boys, 60% of which occurred in practice. None of the kids suffered a concussion, but some of the shots they took were brutal: 11 of the hits registered a g-force of 80 or greater. “That’s the level you might see in car crashes,” says Stefan Duma, a Virginia Tech professor. As the risk of concussions and brain trauma has become better understood and more widely known, fewer young people are playing the game. From 2007 to 2013, tackle-football participation fell 26.5% among U.S. kids ages 6 to 12, according to the Sports & Fitness Industry Association–the sharpest decline of any major team sport. The falloff is happening across the U.S., from New Hampton, Iowa, which scrapped its third- and fourth-grade tackle leagues in favor of flag football, to Marshall, Texas, in the heart of Friday Night Lights country, where seventh-graders are no longer allowed to play full contact. Hoping to reverse this slide, leagues from Pop Warner to the pros are regulating the amount of contact in practice. In July, California adopted a law banning full contact–like blocking and tackling–in youth football during the off-season while limiting it to three hours per week in season. Arizona, Michigan and Texas have adopted contact limits. At the college level, conferences like the Pac-12 and Ivy League have set a weekly cap on full-contact hours. Even the NFL now allows teams just 14 full-contact practices during the regular season. But those rules apply only to practices. Football is, at its core, a violent sport. In games, every play is a collision of bodies–and often brains. And the potential for danger is particularly acute at the high school level, where concussion rates are 78% higher than in college football, according to the Institute of Medicine. Eight people died playing football in 2013, the highest toll since 2001, when there were nine, according to the National Center for Catastrophic Sports Injury Research at the University of North Carolina. All were high school players. During the 2013–14 academic year, no other high school sport directly killed even one athlete. The 1.1 million high school football players are too old to be coddled in peewee leagues but often lack the medical care and support available to college and pro players. There is no national organization governing high school play, so each player’s safety depends in part on whatever local regulations exist and the vagaries of school budgets. It’s at this level, perhaps more than any other, that we need to ask a fundamental question: How much risk is too much? The game was tight from the start. After the teams traded touchdowns, Sacred Heart marched down the field and was close to scoring again. With the ball near the goal line, Sacred Heart called a running play. As Chad drew a bead on the ball carrier, the two boys lowered their heads, and their helmets met with a rattling crack. It was a nasty-looking collision, but Chad popped right up. Teammate Ryan Wood ran over to check on him but didn’t see anything out of the ordinary. Neither did his friend Dylan Cooper, Tipton’s quarterback. Chad’s friend Richardson says Chad was quieter than usual when the team took the field for the second half. “He was acting kind of weird,” Richardson recalls. If so, the coaches did not notice. Chad stayed in the game. In the fourth quarter, a touchdown pass put Sacred Heart ahead, 27-18. It would be the final score. Two Sacred Heart parents–a registered nurse and an ophthalmologist–rushed out of the stands to attend to Chad when he fell. Missouri does not require an athletic trainer or ambulance at football games, and neither was in attendance at this public-school field in Sedalia. Chad was breathing “shallow and slowly” when the fire department arrived at 9:15 p.m., according to government records, and was unresponsive to “verbal and painful stimuli,” like a hard pinch. Knowing that the boy’s brain was starved for oxygen, a fire official cleared an airway and put a bag valve mask over his face. The ambulance arrived about eight minutes after the 911 call and ferried the unconscious player to a helipad not far from the stadium. Chad was airlifted about 50 miles (80 km) to the trauma center at University Hospital in Columbia. Chad was put on life support with significant hemorrhaging and oxygen deprivation in his brain, and for the next two weeks the family kept a vigil at his bedside. Family, friends and even rival players rotated through, and on some nights the crowd in the waiting room swelled to almost 80 people. “Pray for Chad” became a statewide rallying cry. The Diocese of Jefferson City organized a novena–nine consecutive nights of prayer–at the Catholic church in Tipton, and red ribbons were tied around seemingly every tree and signpost in town. California, a nearby school, painted Chad’s number, 18, onto its field. But there was no good news to report. “We seem to slip backwards a little more everyday,” Amy wrote on Nov. 12. “He has so many different injuries going on in that beautiful head of his.” Two days later, the family gathered around his bed to say goodbye. Amy held one of Chad’s hands and sang “You Are My Sunshine”–“because that’s what I sang to him when he was a baby.” Ken held his son’s other hand. “I told him how proud I was of him. How much I loved him. And it was O.K. to go.” Within hours, he was gone. The official cause of death was blunt-force injury to the cranium. The autopsy found Chad to be a “well-developed, well-nourished slender young man” with no history of head trauma. It is impossible to know if the collision just before Chad collapsed caused the fatal injury or whether that blow simply triggered a second-impact syndrome related to the helmet-to-helmet collision in the first quarter. “Sometimes a single, less violent hit to the head can do all the damage alone,” says Jamshid Ghajar, a professor of neurosurgery at Stanford University School of Medicine and the president of the Brain Trauma Foundation. Does the public have the will to push the game further? For all the bad publicity and damning scientific research, the business of football is bigger than ever. Annual revenue for the NFL is some $10 billion, tops among U.S. professional sports leagues. Legions of fantasy-football players hang on every game, and pro games are now broadcast on television three days a week. The NFL expects its yearly haul to grow to $25 billion by 2027. On Sept. 11, three days after the Rice video exposed an ugly face of the national obsession, 20.8 million people watched Rice’s former team, the Baltimore Ravens, play the Pittsburgh Steelers on CBS and the NFL Network. As the Tipton Cardinals opened this year’s season on Aug. 22, one promising freshman wasn’t on the field. 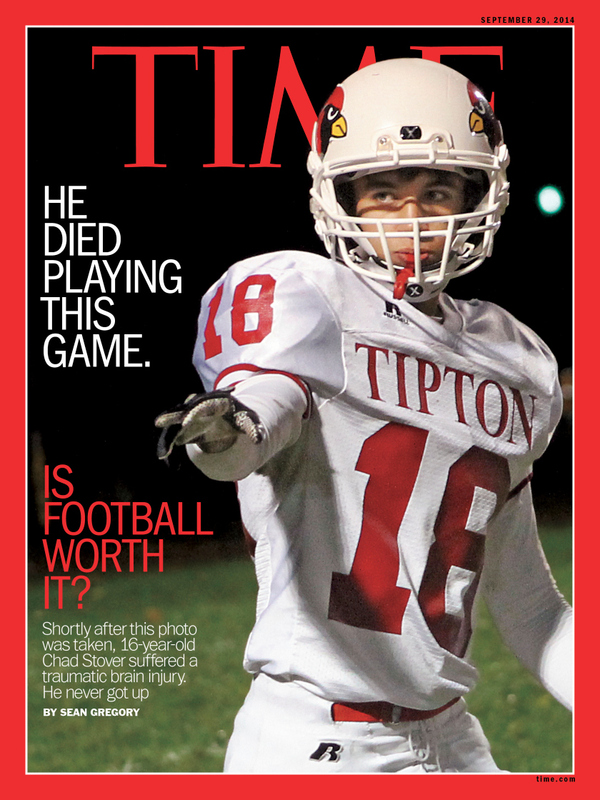 Kenton Stover, Chad’s 15-year-old brother, decided to give up football after Chad died. He says he recalls headaches from collisions during youth games, and now that he knows the risks, his decision was easier. And he doesn’t want to worry his parents. “It’s just scary for all of us now,” he says. It isn’t easy to abandon football in Tipton. “Here, high school football is everything,” says Stewart Wolf, a construction worker drinking a Bud Light at the Skylight Bar on Tipton’s block-long downtown. “There’s not a lot to do in Tipton.” On Friday nights, fans pack the bleachers and sit on the hill behind the east end zone. Often there are so many people that the overflow crowd spills into the parking lot of the Koechner turkey-coop manufacturing business across Highway 50. This appears in the September 29, 2014 issue of TIME.